Vigil Games says some former employees were left out of the Darksiders II credits because they were "let go for documented poor performance." Very shortly after it was released, Darksiders II user interface designer Xander Davis took to Twitter to complain that his name wasn't in the credits. "Oh delightful. Just found out I'm not even credited on Darksiders 2 when the UI is 99% from my direction & hard work, done in record time," he wrote. "I led the revamp effort, created the pipeline, redesigned & rebuilt every screen, worked till 2AM every night, worked w/ leads every step." In follow-up tweets, he claimed that he was "whisked to Austin" and tasked with fixing the game's UI, which was apparently a complete mess, mere months before the game was shipped. He and his team got the job done and then, after "revamping 27 screens in 30 days, providing a new art direction, new layout & flow," he was cut. "I was let go a month after DMO [Dark Millennium Online] changed, they merged the other UI team, & Herb Ellwood swooped in & stole my job. After all my hard work," Davis tweeted. "Herb Ellwood only had a contract with THQ. He used the team merging (which we needed to make ship) to secure a salary. Mine." Vigil Games, however, puts a slightly different spin on the tale. 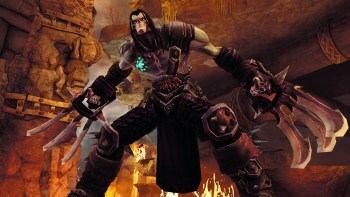 In a statement sent to VGRevolution, General Manager David Adams stated that while Darksiders II was in development for more than 2.5 years, Davis only worked on it for 90 days, and more to the point implied that he wasn't laid off when the job was complete, he was fired for sub-par performance. "When we were forced to reduce staff due to the cancellation of a project, we worked hard to ensure every single person effected by the layoff received their credit in the game.Â We did not include individuals whose employment terminated for any other reason, for example, being let go for documented poor performance," Adams said. "To reiterate, Vigil's primary concern while doing Darksiders II credits was that we credited team members that were affected by the recent downsizing. We were not focused on the issue of employees that voluntarily left or were fired from the company. We find it alarming that a former employee would personally attack and lie about other team members while falsely inflating his contribution to the game," he continued. "We thank, once again, all those who positively contributed to Darksiders II." There's no way to know who the aggrieved party really is at this point, although as my fellow news guy Mike suggested, it's probably "a little from column A, and a little from column B." Davis is well within his rights to be mad as hell if he really did get the bum's rush after cleaning up Vigil's mess, although I have to think there are more productive ways to seek redress than a torrent of angry tweets. He'd already pre-dismissed any explanation from Vigil, however, and earlier today, after it came out, called the studio's response "totally expected." "I didn't anticipate they'd be like - 'oh hey yknow what? He's right!' Of course not," he wrote. "I said my piece."